This is an over sized Red Grosgrain Bow! This has very large loops and tails, has a French knot in the center and is attached to a French clip. This picture and video does show the added feature of the embroidered front tail, so if you like this just make sure to add embroidery in the cart. 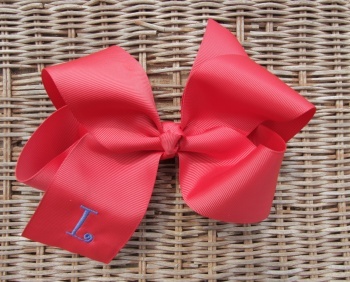 If not, it looks great alone and this is the Big Bow Status that you are looking for!